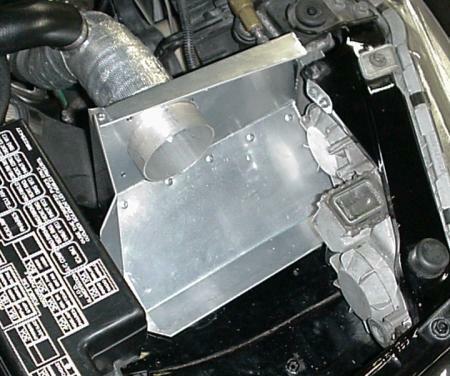 We had a little downtime, so we finally got around to fabricating the airbox. The flange has been on the intake pipe for a while now, and the intake temperature reduction is not insignificant, so it's worth doing. It's made of sheet aluminum, riveted together. 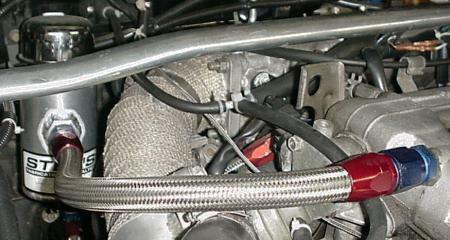 It seals off the air intake area from the rest of the engine compartment. A strip of foam will be glued on top of the divider to seal it to the hood. I don't have a sheet metal brake, but a Workmate and a strip of angle iron works pretty well. I used to have a Mountain Dew can acting as a breather catch can - light and easily replaced. But I got tired of answering questions about it, so now it has been replaced with a proper breather tank and a -10 AN line.